Sports School Holiday Programs & Clinics. North Shore Vacation Care. We are excited to launch an Active Sports clinics to be held at various locations throughout the North Shore this July 2019 school holidays. These clinics will provide opportunities for children to participate in a variety of sports. Your child may love playing sport but can’t pick a favourite or wish to try different sports to see which one they like best. The school holiday cricket clinics are a great opportunity for your children to have fun, learn new skills and develop game awareness. All Geoff’s clinics encourage children to challenge themselves and make new friends in a safe and inclusive environment. Relax knowing your children are well supervised, learning and active under the control of highly experienced teachers and accredited coaches. Coaching clinic activities are designed by Geoff Spotswood to assist children to learn about values of sportsmanship and teamwork. Children also have fun and engage actively with other children. Clinics are open to girls and boys aged from 5 to 12 years. Each clinic follows a similar format which provides an exciting and fun-filled program for every kid regardless of age or experience. You don’t have to be good at sport or have any experience to have a great time. On the final day of clinics, kids are organised into teams for a World Cup of matches. This is an exciting way to conclude clinics and all players look forward to these matches. Older players are given the responsibility to captain & develop their leadership skills whilst assisting younger children in understanding how to play cricket. Parents and family are welcome to attend these games. There is a presentation at the conclusion of clinics where all players are presented with an individual report by their coach giving feedback on areas of strength & areas to focus on for further development. Parents and family are encouraged to attend presentations. Photographs may be taken during clinics but will only be used for Geoff Spotswood coaching promotions. 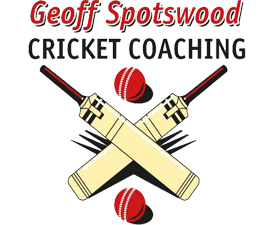 Geoff Spotswood is an expert cricket coach (Level 3) and leading educator who coaches all cricketers from young beginners to adult players. He is also one of the few sportsmen who have played first grade cricket and rugby league. The cricket coaching programs Geoff conducts are well respected and highly regarded. Many current Cricket NSW and Australian representatives have been guided and mentored by Geoff including Steve and Mark Waugh. Geoff uses his unique cricket coaching program which has assisted experienced players from Australia and overseas to develop their game. Geoff also runs school holiday cricket clinics in locations throughout Sydney where young cricketers can learn and develop their skills in a safe and friendly environment. Additionally, Geoff’s accredited and friendly coaches can organise fun filled cricket and sport themed games at your child’s birthday party and bring all the equipment needed.